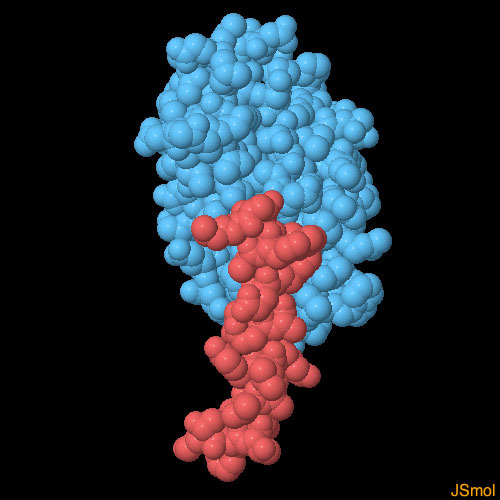 Glucagon receptor, with glucagon in red. The membrane is shown schematically in gray. Too much glucose in the blood can lead to serious problems like diabetes, but too little glucose will also cause problems, starving cells throughout the body. Your body uses two main hormones, secreted by cells in the pancreas, to get the balance just right. Just after we eat, insulin is released, telling cells to take glucose out of the blood and store it for future use. 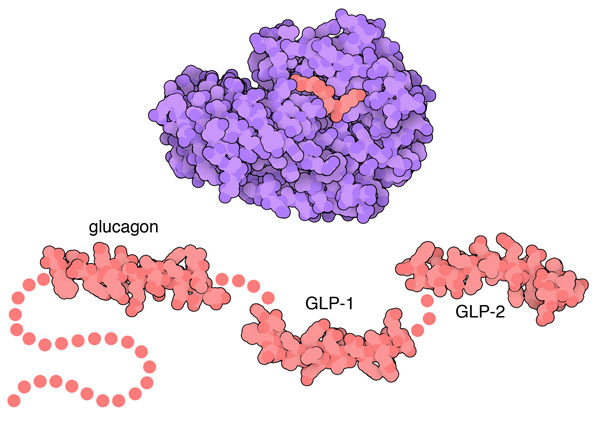 Between meals, glucagon is released and has the opposite action, telling these same cells to release glucose for use in energy production and metabolism. 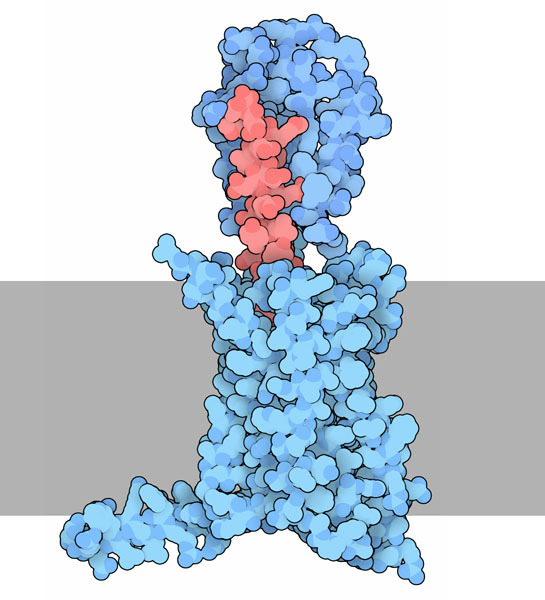 Glucagon (shown in red) is recognized by cells using a G-protein-coupled receptor (shown in blue). This receptor is a bit different than a typical GPCR, like the one that recognizes adrenaline. It has an extra domain on the outer side of the cell (shown at the top of the illustration here), which traps glucagon and delivers it to the membrane-spanning portion. When glucagon binds, it activates G-proteins inside the cell, starting off a cascade of responses that lead to release of glucose. Since the glucagon receptor has several moving parts, it has been a challenging target for structural study. The image shown here is a model of the whole complex built from several different PDB entries. Glucagon, which folds into a short alpha helix, is taken from a crystal structure of the isolated hormone, from PDB entry 1gcn . The extracellular domain is taken from a structure bound to an antibody, from PDB entry 4ers . The signature 7-helix bundle of the membrane-spanning portion is taken from PDB entry 4l6r . Furin (top) and three hormones created from proglucagon (bottom). Glucagon is one of a collection of similar hormones that help manage metabolism. Several are built together as a longer protein, called proglucagon. Then, enzymes termed prohormone convertases clip it into the functional hormones. Three are shown here: glucagon (PDB entry 1gcn ), glucagon-like peptide 1 (PDB entry 3iol ), and glucagon-like peptide 2 (PDB entry 2l63 ). The convertase shown here is furin (PDB entry 1p8j ), which is similar to the ones that process proglucagon. The extracellular domain of the glucagon receptor has the job of finding glucagon. It binds to one end of the short hormone helix, leaving the other end free to insert into a deep pocket in the transmembrane domain, activating the receptor. The structure shown here (PDB entry 3iol ) shows the binding of GLP-1 to the extracellular domain of its receptor, which is quite similar to glucagon and its receptor. To explore this structure in more detail, click on the image for an interactive JSMol. Several structures for isolated glucagon and modified forms of glucagon are available in the PDB, showing that it has a range of conformations in different environments. Try searching for "glucagon" to see a few of them. You can use the Protein Feature View to explore the different hormones created from proglucagon. D. Bataille & S. Dalle (2014) The forgotten members of the glucagon family. Diabetes Research and Clinical Practice 106, 1-10. K. Hollenstein, C. de Graaf, A. Bortolato, M. W. Wang, F. H. Marshall & R. C. Stevens (2014) Insights into the structure of class B GPCRs. Trends in Pharmacological Sciences 35, 12-22. 4l6r: F. Y. Siu, M. He, C. de Graaf, G. W. Han, D. Yang, Z. Zhang, C. Zhou, Q. Xu, D. Wacker, J. S. Joseph, W. Liu, J. Lau, V. Cherezov, V. Katritch, M. W. Wang & R. C. Stevens (2013) Structure of the human glucagon class B G-protein-coupled receptor. Nature 499, 444-449. 4ers: C. M. Koth, J. M. Murray, S. Mukund, A. Madjidi, A. Minn, H. J. Clark, T. Wong, V. Chiang, E. Luis, A. Estevez, J. Rondon, Y. Zhang, I. Hotzel & B. B. Allan (2012) Molecular basis for negative regulation of the glucagon receptor. Proceedings of the National Academy of Science USA 109, 14393-14398. 2l63: K. C. Venneti & C. M. Hewage (2011) Conformational and molecular interaction studies of glucagon-like peptide-2 with its N-terminal extracellular receptor domain. FEBS Letters 585, 346-352. 3iol: C. R. Underwood, P. Garibay, L. B. Knudsen, S. Hastrup, G. H. Peters, R. Rudolph & S. Reedtz-Runge (2010) Crystal structure of glucagon-like peptide-1 in complex with the extracellular domain of the glucagon-like peptide-1 receptor. Journal of Biological Chemistry 285, 723-730. 1p8j: S. Henrich, A. Cameron, G. P. Bourenkov, R. Kiefersauer, R. Huber, I. Lindberg, W. Bode & M. E. Than (2003) The crystal structure of the proprotein processing proteinase furin explains its stringent specificity. Nature Structural Biology 10, 520- 526. 1gcn: K. Sasaki, S. Dockerill, D. A. Adamiak, I. J. Tickle & T. Blundell (1975) X-ray analysis of glucagon and its relationship to receptor binding. Nature 257, 751-757.